Perpetual Nostalghia: How High the Moon? It does seem likely that both the singing and the guitar are being performed under the performer’s skill level; from what I’ve heard, Karen O is generally more assertive in her attack (even in lending monumental flourishes to Flaming Lips’ “Watching the Planets”) and charismatic in the lower end of her range (which goes mostly unused here). This is a stylistic choice on Karen O’s part, but the musicianship on the guitar doesn’t register with the listener as nuanced. It doesn’t seem clear how deliberate the guitar’s underperformed instrumentation is, but it sabotages the nuance in any principle behind Karen O’s singing choices. The guitar here is played consistently, with a beginner’s strum and often a beginner’s attack. The recording has some charming squeaks and unexpectedly muted strings on barred chords here and there, which indicates a little bit of poor technique. From a songwriting position, the song plays it safe on beginner chords (a nice ii-V-I in the open-position C major). As a template, the rhythm and the chords here are quite underwhelming, and by the time the F to F minor comes along for the “million miles away,” it is too little, too late. The F minor chord adds a small bit of flavor but in a way that makes its own cleverness as a song seem slight, like the whole piece is a draft or, worse, that this sophomoric attempt at chord cleverness was purposefully executed as if it were an afterthought. The underwhelming nature of the guitar bogs down Karen O’s efforts; it makes her look like she’s weirdly overcompensating by intentionally under-singing. Because of this, the song feels underdeveloped; the chords, strum, and general sparseness are all elementary enough to purposefully give off that vibe. The strumming pattern and chord sequences are choices very familiar to many songwriters that are simply poking around on a guitar until a better idea comes along. In the interest of giving the song some credit for how “off” it sounds, perhaps the “calculated authenticity” is intended to parallel the “off-ness” in the film’s core relationship, or be a commentary on how what is authentic or calculated about the film’s central relationship. Regardless, it feels like “The Moon Song” might have benefited, oddly enough, from a little bit more development. Oftentimes the recording feels like a premeditated improvisation, and in this regard it is a success. But does successfully mimicking a rough draft make for a good final draft? In most cases, the answer is no. 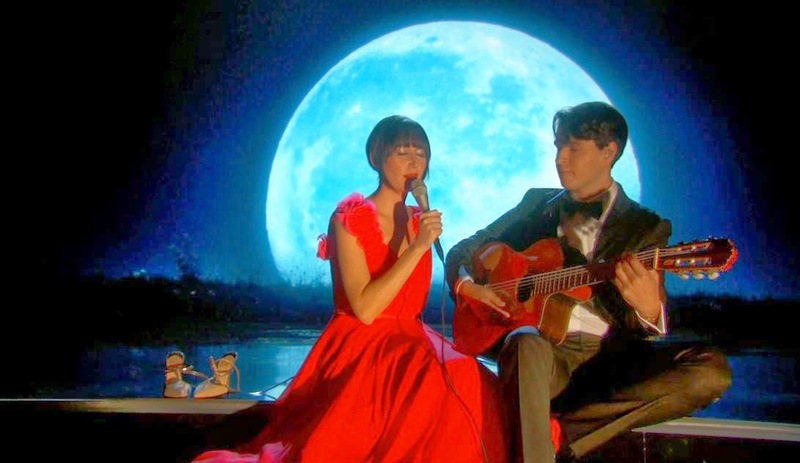 “The Moon Song” fell short of capturing what could have been a heartfelt and resonant tentativeness; instead it is a blandly maudlin moan. And the worst thing is, it sounds like it fell short on purpose, as if it were part of the plan all along. 1 Side note: For those seeking that truth and rawness in music of a similar character, check out Privacy’s record “Without Mercy.” “The Moon Song” reminded me strongly of Privacy, and it is a strong record.